Rese­arch sci­en­tists have to have more than just sci­en­ti­fic know­ledge ‑ they also need pati­ence. School pupils who con­ti­nue to work on their pro­jec­ts right through the New Year break pro­ve that they have the necessa­ry stay­ing power. 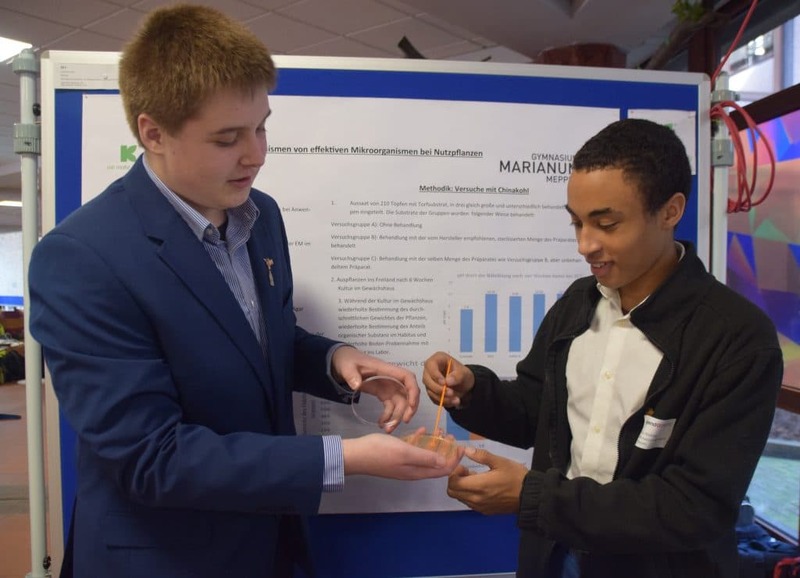 Two pupils of Maria­num high school who took part in the com­pe­ti­ti­on con­duc­ted rese­arch into effec­tive micro-orga­nisms and were rewar­ded for their stami­na in the regio­nal round of “Jugend forscht”. Klasmann-Deilmann congra­tu­la­tes them on their suc­cess. The coope­ra­ti­on bet­ween Maria­num high school in Mep­pen and Klasmann-Deilmann in Gees­te has mean­while beco­me a tra­di­ti­on. We ser­ve as con­tac­ts for the pupils and encou­ra­ge their sci­en­ti­fic curio­si­ty, pro­vi­de pre­mi­ses and mate­ri­als and also offer pro­fes­sio­nal assi­s­tan­ce. Regi­na Wil­kens is a bio­lo­gy and che­mi­stry tea­cher at Maria­num high school and coor­di­na­tor for maths, IT, sci­ence and tech­ni­cal sub­jec­ts. She is also in char­ge of the “Jugend forscht” stu­dy group and has alrea­dy sought our sup­port on several occa­si­ons in the past. The first time, back in 2009, the pupils inves­ti­ga­ted the effect of ter­ra pre­ta (black earth found in the Ama­zon Basin) on plant growth. Timo Väh­ning, Alex­an­der Base­ni­us and Bernd Nord­zie­ke assess the habit of the sweet pep­per plants. During the last school year, Alex­an­der Base­ni­us (9th form) stu­di­ed effec­tive micro-orga­nisms (EM) tog­e­ther with Timo Väh­ning (13th form); they con­duc­ted expe­ri­ments in our green­house in Gees­te and won the regio­nal round of the con­test. This year, Alex­an­der tack­led the sub­ject again, this time with fel­low pupil Nji­ku Well­mer (12th form). The ques­ti­on was the­re­fo­re to find out how the plants would deve­lop when grown as a field crop. 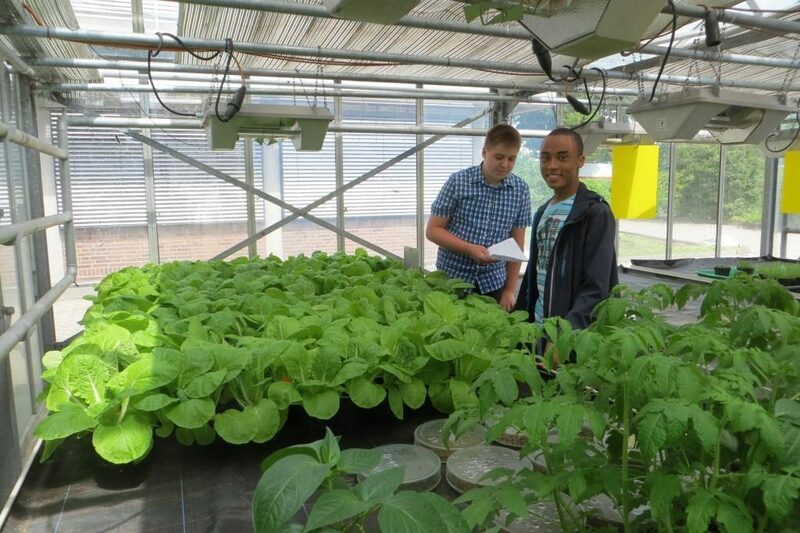 In the green­house in Gees­te, the pupils sowed a total of 210 Chi­ne­se cabba­ge plants “Right from the start we wan­ted to rule out the pos­si­bi­li­ty that any posi­ti­ve effect of the EM pre­pa­ra­ti­on could only be due to the nut­ri­ents it con­tains. We the­re­fo­re also trea­ted some plants with ste­ri­le effec­tive micro-orga­nisms for refe­rence. We hea­ted the pre­pa­ra­ti­on to 70 degrees to make it ste­ri­le,” said Nijku Well­mer. To enab­le a pro­per com­pa­ri­son, 70 plants were grown wit­hout the pre­pa­ra­ti­on, ano­t­her 70 recei­ved the pre­pa­ra­ti­on and the remai­ning 70 plants were trea­ted with the ste­ri­le pre­pa­ra­ti­on. After six weeks, the pupils then pre­pa­red their test field in the school gar­den of Maria­num high school in Mep­pen with the help of Bernd Nord­zie­ke, who ana­ly­sed the soil, sup­plied sui­ta­ble fer­ti­li­ser and deli­ve­r­ed the plants which had been brought on in the green­house. He was also on call to pro­vi­de prac­ti­cal help and advice throughout the pro­ject. Need­less to say, the stu­dents wan­ted to achie­ve sci­en­ti­fi­cal­ly sound results, which meant that they could not afford to make any mista­kes in the gro­wing pro­cess. Four and a half mon­ths later, they could begin to eva­lua­te the results and found that the plants that had been trea­ted with the EM pre­pa­ra­ti­on did in fact achie­ve hig­her weights than the refe­rence plants. The plants trea­ted with the ori­gi­nal effec­tive micro-orga­nisms fared bet­ter than tho­se that had recei­ved the ste­ri­li­sed pre­pa­ra­ti­on. The­se fin­dings came as a sur­pri­se to the stu­dents, who then set out to find the cau­ses. They deci­ded to con­duct fur­ther rese­arch into the orga­nisms con­tai­ned in the pre­pa­ra­ti­on and their meta­bo­lism. This was the start of a labour-inten­si­ve and time-con­suming pro­ce­du­re that had to be repeated every few days to select the micro-orga­nisms and keep them ali­ve: Petri dis­hes had to be fil­led with the nut­ri­ent medi­um or selec­tive media, ino­cu­la­ted with the pre­pa­ra­ti­on and then trans­fer­red to the incu­ba­tor. It was vital not to inter­rupt the pro­ce­du­re at any time, not even for a holi­day such as New Year, so that the stu­dents also spent 1 Janu­a­ry in the lab. The selec­tion of nut­ri­ent media and the beha­viour of the colo­nies on the dif­fe­rent media pro­du­ced the first fin­dings for the stu­dents: a colo­ny rai­sed on fun­gal agar, for examp­le, fai­led to deve­lop. They then exami­ned the colo­nies more clo­se­ly under the micro­scope and com­pa­red the visu­al para­me­ters, tested the chan­ge in the pH value of the liquid medi­um and loo­ked for con­spi­cuous cha­rac­te­ris­tics such as smell. Demons­tra­te work with ino­cu­la­ti­on loop and Petri dish at the regio­nal round of „Jugend forscht” – Alex­an­der Base­ni­us and Nijku Well­mer. The stu­dents iden­ti­fied lac­tic acid bac­te­ria, yeast fun­gus and red mould bac­te­ria and began to exami­ne their meta­bo­lic pro­ces­ses. They came to the con­clu­si­on that the effec­tive micro-orga­nisms con­tai­ned in the pre­pa­ra­ti­on rai­sed the pH value of the soil. “In field crops, that is a clear advan­ta­ge,” said Alex­an­der Base­ni­us, “if the soils are com­pa­ra­tively aci­dic and the­re­fo­re not the opti­mum medi­um for plant growth. In that case, the effec­tive micro-orga­nisms can neu­tra­li­se the pH value of the soil,” exp­lai­ned the young sci­en­tist. Moreo­ver, nitra­te had occur­red as a result of the meta­bo­lic pro­ces­ses. 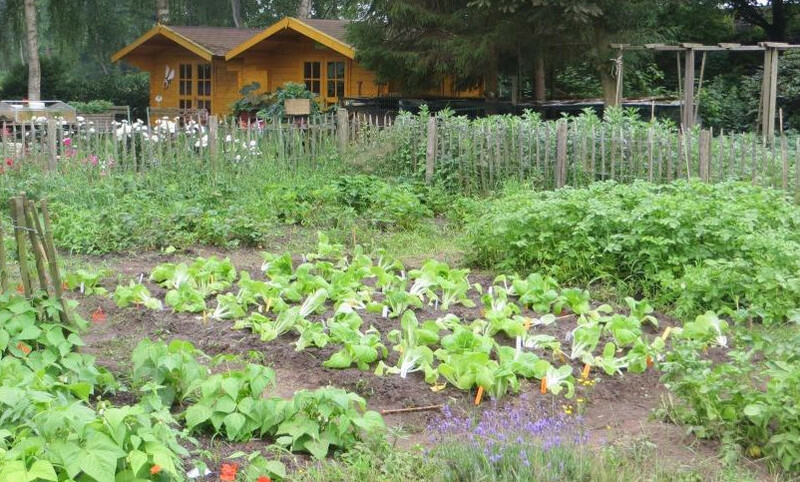 “That is a typi­cal fer­ti­li­ser, which means it also has a posi­ti­ve impact on plant growth,” added Nijku Well­mer. The two pupils pre­sen­ted their fin­dings to the jury of the regio­nal round of “Jugend forscht” in Lin­gen and per­for­med well: they won first place in the Bio­lo­gy sec­tion, which means they will go on to the next round in Claus­thal-Zel­ler­feld in March, whe­re the best con­tes­tants from the who­le of Lower Sax­o­ny will com­pe­te. They also won a spe­cial pri­ze, the Regio­nal Busi­ness Award which Osna­brück ‑ Ems­land ‑ Graf­schaft Bent­heim Cham­ber of Indus­try and Com­mer­ce has awar­ded sin­ce 2008 to pro­jec­ts desi­gned by school pupils which are both ambi­tious and also sui­ta­ble for app­li­ca­ti­on in a busi­ness envi­ron­ment. Congra­tu­la­ti­ons to Alex­an­der Base­ni­us and Nijku Well­mer on their suc­cess­ful per­for­mance and good luck for the next round.